Specific. Measurable. Achievable. Realistic. Time-Bound. When setting goals for any area in life, following the S.M.A.R.T. blueprint is a good method to follow. In choosing to focus on the following 10 smart money goals, I offer examples that are common to the average person. 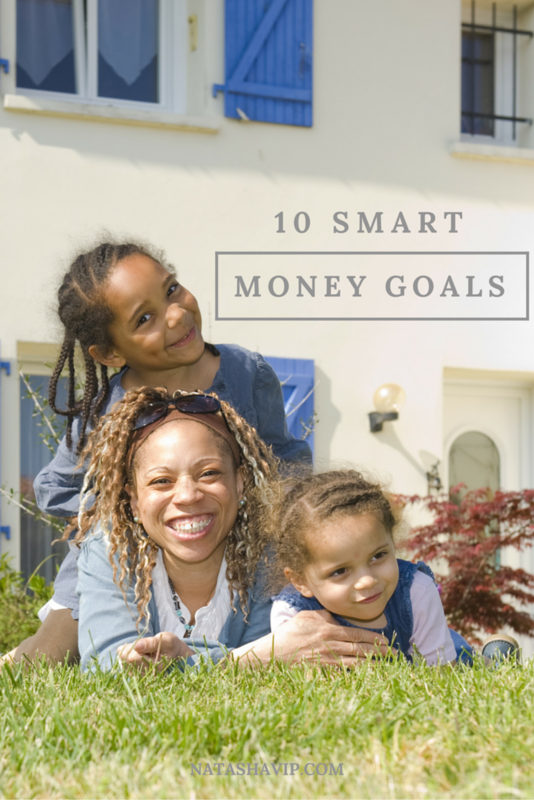 As you prepare to either use these 10 smart money goals as a template or develop your own, be as specific as possible. General goal statements won’t work when you’re ready to take control of your money and tell it what to do for you. Specific – State exactly what you intend to accomplish. Measurable – How much? What is the dollar amount, for example. You have to know if you’ve been successful in reaching the goal. Achievable – Can you really accomplish the goal in the time-frame you’ve set? Is the dollar amount realistic when you look at your total budget? Realistic – More than likely you can’t pay off your credit card in one month. So, give it a more doable time-frame. Time-Bound – Set a specific time-frame. This makes it easier for you to calculate the costs involved spread out over that time and break out your goals into several chunks if necessary. To save a 6 month emergency fund over 3 years. If you don’t have an emergency fund, you have to make this one of your top priorities. As you examine your particular financial situation, you can better determine how much should be in your emergency fund and over what period of time. Let’s break this down somewhat. I have two emergency funds if you will. My main emergency fund can only be used in very dire circumstances. For example, in case of job loss or a medical need not covered/not fully covered by insurance. Otherwise, this money shouldn’t be touched. The mini-emergency fund, I guess we can call it, is for cases when the car breaks down, for example. You may only keep $1,000 in this account. Again, since you’re working on the steps from my day one post, you’ll be able to calculate the needs of your family. This fund may also be called a variable expense account. Whatever you choose to call it, be sure you lock down the exact responsibility of each account. Write it down. You don’t want to try to keep too much information in your head. Finally, it takes time to build a 6-month emergency fund. So patience and dedication is key here. As I said in day one and day two, you will have some bumps in the road but you have to journey on. To pay off all credit card debt over 4 years. I’m sure you’ve heard this saying before but here goes anyway. 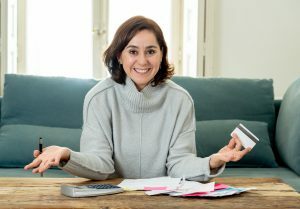 You didn’t get into credit card debt overnight, so you won’t be able to pay it off over night. Set a realistic budget that includes your credit card payment that allows you to reach your payoff time-frame. From time to time, you will analyze your finances to see if you can increase payments and reduce the time-frame. When you receive raises, consider allowing that portion of money to also go toward debt payoff. Stay focused and keep your attention on your money. No more autopilot for you with this. Now is the time to go to battle and eliminate this debt. Free up your money so you can do more meaningful things with it like save for a down payment for your home or take your family on a vacation. 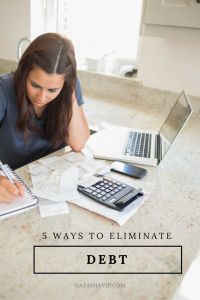 Yes, you probably can do this while paying off debt but getting rid of this debt just makes things easier. I won’t sugarcoat anything for you. I’m currently in my final stages of paying off credit card debt and as I get closer the more freedom I feel. I don’t necessarily want to buy more things or go anywhere. I just love the peace of mind. To save for a home down payment over 5 years. As I stated above, many of us want to purchase our first home or second home. In my case, I’m looking to purchase my second home. I bought my first home at age 22, a townhouse that I now currently rent to a nice single mom of two boys. If you have staggering credit card debt, I don’t believe you should purchase a home. I’ve been there and done that and it’s no fun when repairs are needed. Money can be tight and it causes extra stress. This is why it’s so important to get rid of debt and pay off small bills. You have income freed up to do what you really need to do and take care of issues as they come. And oh will they come?! They surely do and right at the moment when you don’t need anymore problems. Again, this is why budgeting is very important. It gives you a road map. Further financial planning gives you an outlook on when each goal will be completed and how to make it happen. If you want to buy a home but not ready, I want you to know that you’re not alone but more importantly you’re not on anyone else’s timetable but your own. Put in the work and you can make home ownership possible for you and your family. To create a budget every month. So, I’ve been talking about budgeting a lot because it’s important. I also need to point out that you can’t put this on autopilot either. Your budget numbers more than likely will change each month for most items. For example, if you’re going to a wedding one month, you need to account for the purchase of a gift in your budget and then adjust the remaining numbers accordingly. What you are aiming to do is to give a realistic number to each item and have a zero balance at the end. This means that every penny has a job and you’ve totally balanced your budget for that month. To cut spending on eating out by 50%. Now I had to include this one because I’m so guilty of this. My daughter and I eat out too much. Simply put, I don’t like to cook. And what I do cook isn’t that difficult. I guess it’s just a mind thing that I have to overcome. I could save so much more money if I treated going out to eat as an occasion rather than a regular routine. I’ve tried meal planning and haven’t been successful at it yet. I’d do it for a while and then fall off. But it works. So, I encourage you to try it if you haven’t. It cuts down on trips to the grocery store and you’ll be amazed at what you can create from items you already have on hand. To save $2,000 for a family vacation to Disney World over 24 months. This is another one that I had to use because I saved over a 7 month time period for a trip to Disney World with my daughter. I had initially planned to save over 12 months but life got in the way. But I buckled down and made it happen in the 7 months that I had. I saved over $2,000 for this trip and it was truly magical. I wanted us to enjoy without me worrying about being able to pay bills when I returned home, and I didn’t want to take from my regular savings account. Side note: Planning for a trip to Disney World is an experience itself. You don’t want to go there blindly because it can be overwhelming. Check out this affiliate link to this handy guide all about Disney World! So, again sacrifice, patience and dedication will aid you in meeting this goal. If you sit down and really do some planning you can start saving now and take your trip in 24 months. This allows you to have to save less each month toward this goal than say a 12 month time frame. Again, look at your financials to see how you can make this happen. To increase my giving amount by 10% in 2 years. Some of us want to give more to our churches or causes we care about. But when you’re already struggling to meet your own needs, it can be difficult to even think about giving to help someone else. If it’s in your heart to give more, you can absolutely do so. This goal requires the same amount of attention and effort that you give to your other goals. Another great reason to eliminate the credit card debt as quickly as possible. In terms of giving while you’re in debt, I’ve heard several arguments for and against it. I will tell you that I have given and continue to give while in debt. That is my personal conviction and I feel comfortable in that. I believe you have to search within yourself for the best answer for you. I do not believe this is a one-size fits all issue. However, if you ask me, I will suggest that you give. It feels good and it gives you hope for your future. To save 3% monthly of my take-home pay in a home maintenance account. So we discussed buying a home, so what if you already have a home or at the point of purchase. Guess what? It doesn’t stop there. Hopefully you won’t have many repairs if you can keep current on your home maintenance. Things like cleaning gutters, HVAC maintenance, landscape, etc. are all items you can save for on a monthly basis. Without question you know these items will require care. Some maintenance you can do yourself but you’ll still have to purchase the necessary supplies. Make life a little easier and add this line items to your budget. I currently have one for my rental home. It feels great to have that security blanket in place because I know I won’t have to dip into my other savings. To start a college savings plan of $200 per month for my child by 3rd grade. You have children and more than likely you want them to go to college. And you want to help them. Well, a college savings account (I have an upcoming post dedicated to this) is a necessity as well. However, I don’t recommend having one until you’ve cleared out your credit card debt and other loans. It just doesn’t make financial sense as other experts have told us. But once you see the path is clear to do so, set the goal and go for it. My prayer is for my daughter to receive scholarships. However, I still want to be prepared to help her without harming my savings or retirement. As we often heard, you can get loans for education but you can’t for retirement. Something to seriously think about as your plan out your finances. To inquire about lowering interest rates, utility bills, etc. every 6 months. This is something many people don’t think to do but you should call your power company, for example, and talk about your bill. If you feel it’s too high, ask them to come out to perform an energy check for you. Maybe you can do some things differently around your home to decrease it. Most folk have credit cards rates of 20%. If you’ve been paying your cards on time each month, you should call the company and ask to have that rate reduced. 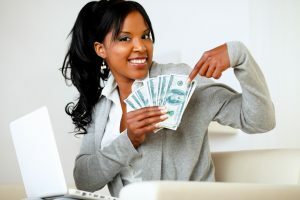 This will help you to pay off the debt faster and pay less money in interest. You can do this monthly, quarterly, yearly, or however often you want. But if you never call to inquire, the answer will always be no. Take charge and save yourself some money. What smart money goals would you add to this list? As a mother of one daughter, I am honored to speak to a community of women - single moms - who are helping to shape our world and lead their families. Single moms are educated, career women, business owners, community leaders, ministers, and so much more! I hope what I do in this space inspires all single moms to live the life of their dreams. Let us shape and tell our own stories! Join the Savvy CEO Mom List! 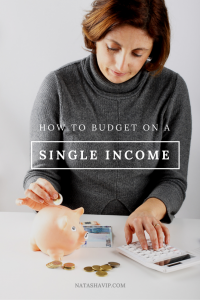 Manage your money with this free budget printable! Grab it now!